People enjoy me on social media too. 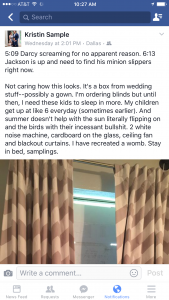 Earlier this week, in an effort combat the longer summer days and make sure my kids sleep in (purely for my own sake), I taped cardboard on their window behind the blackout curtains. See the screenshot from Facebook. Judging by the emojis, other moms are in the same boat or were when their respective children were small ameba-humans like mine. The results have been inconclusive. Darcy is coming down with a cold so who knows what’s going on in her little dragon brain all night. Or who knows why she got up at 5:13 this morning after a long day of pool play time yesterday. 5:13am: I look at the clock but it’s still pitch black outside. I lie to Darcy who is standing eerily silent at my door. “It’s still night-night,” I say and change her diaper. Then I put her back in her crib. 5:38am: I hear a soft thump. No doubt this is Darcy getting out of her crib. Her ninja skills are good until the landing. The monitor shows the empty crib and closed door. She’s up in her brother’s bed tryin’a get comfy. She must be stopped. Jackson can sleep through an atom bomb but not in the early morning hours. I grab her and she is mercifully silent. “Want to lay with mommy?” “Okay,” a tiny nasally voice in the dark. 5:39 am: She lays facing me, eyes closed and smiling. To the victor goes the spoils. She looks cute in the early morning light peeking through the sides of my blackout curtains. 5:42 am: She moves away, now perpendicular to me. And the toe digging in my side begins. I’m reminded to cut her toenails. They feel like small razors. And her feet are surprisingly strong. It’s the worst shiatsu massage ever. Between this borderline torture and her ability to deprive me of sleep, she has a career in the CIA ahead of her. 5:50 am: Sitting up. Playing with both of her lovies. 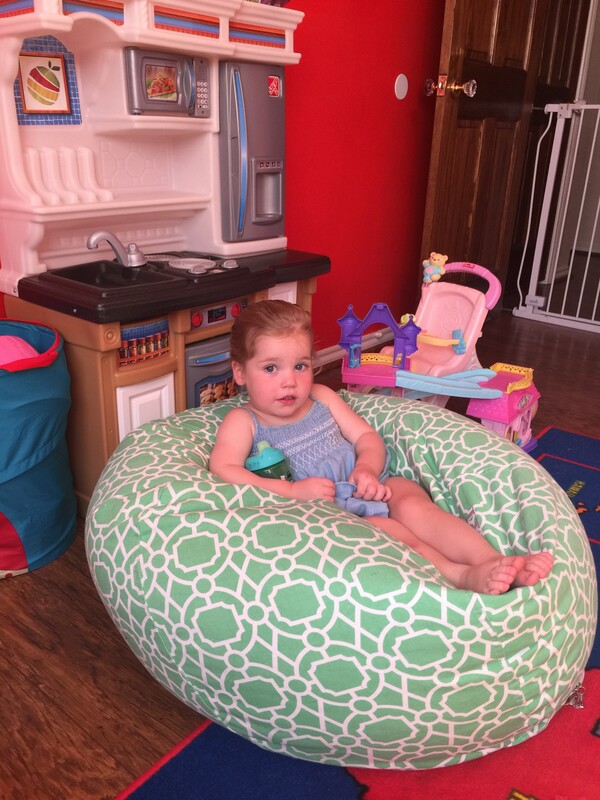 Lounging like a boss at 10am. 5:51 am: I pretend to sleep and Darcy notices. I must needs the lovies. In an expertly executed role reversal, she puts the lovies on my forehead and gives me her blanket. “Night-night, Mommy,” she whispers coyly. Her chance at escape. I clutch the lovies while I decide whether or not to care. The lovies are surprisingly comforting. I spend the next few minutes working through a business plan for adult lovies, ignoring the toddler altogether. 5:56 am: She is at my door fussing with the childlock. No CIA yet for you. Foiled by a piece of plastic around a doorknob. 5:59 am: I doze to the horrifying sounds of children’s programming. My half-dreams while the Yo Gabbas sing are the closest I will ever get to an acid trip, I believe.